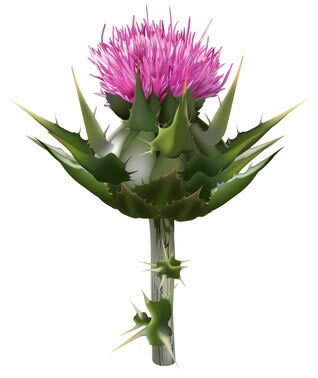 Silymarin is a flavonolignans complex that can be only found in the seeds of Milk thistle (Silybum marianum), a member of the Compositae family native to the Mediterranean, now widespread all over the world. It consists of a mixture of three bioflavonoids found in the fruit, seeds, and leaves of the milk thistle plant: silibinin, silidianin, and silicristin and a flavonoid – taxifolin. Silymarin has strong antioxidant properties (fold times vitamin E) several studies proving its free radical and ROS scavenging effects thus suitable especially for the prevention and treatment in several forms of epithelial cancer. Another area of application for the antioxidant properties of silymarin is topical skin care with results in UV protection, UV effects attenuation, Rosacea, Melasma, acne and other skin pigmentation conditions. The potent anti-inflammatory mechanisms of silymarin are used for wound management, with benefits especially for the patients with healing impairing diseases. Silymarin has very low toxicity and it is well tolerated thus appropriate for human consumption and use. NOTE: To assist you with solubility issues, we now also sell Silymarin as two liquids: standardized pre-dissolved solution and standardized ethosome microemulsion. Just add the liquid to your cream and mix well. 13% solution gives 1% Silymarin content in final product. 38% solution gives 3% Silymarin content in final product. 63% solution gives 5% Silymarin content in final product. 34% solution gives 1%Silybin content in final product. 67% solution gives 2% Silybin content in final product. The main focus in silymarin effects is based on its antioxidant properties. As any bioflavonoid silymarin scavenges free radicals that can damage cells exposed to toxins. Silymarin has been said to be at least ten times more potent in antioxidant activity than vitamin E . One of the silymarin non-flavonolignan isomer, taxifolin, is also known to have powerful antioxidant properties, thus enhancing the overall preventive and curative effects . Numerous studies focused on silymarin emphasized categorical benefits as an anti-hepatic cancer by inhibiting proliferation and inducing apoptosis in the human hepatocellular carcinoma cells . Double blind, randomized, prospective tests in patients with liver cirrhosis showed a considerably higher survival rate in the silymarin treated group . Recent studies highlighted that the anti-toxic effect of the silymarin is not based on fighting the toxin as supposed but by having an inhibitory action trough binding to cell membranes and therefore inhibit toxin penetration of the cell membrane . Due to good skin penetration of its flavonolignans - especially silibinin – silymarin is the ideal candidate for topical skin care . Multiple studies were conducted, confirming silymarin increased efficiency in UV protection and skin cancer prevention and treatment. Skin exposure to solar UV radiation induces a number of skin disorders, including erythema, edema, immune suppression, photoaging, melanogenesis and skin cancers. Both UVA and UVB radiation activate the generation of reactive oxygen species (ROS), which create oxidative stress in skin cells and play an essential role in initiation and proliferation of skin aging and carcinogenesis. Because of its potent antioxidant activity and recognized potential as an antiphotodamage and anticarcinogenic agent, the extract of Silybum marianum is suitable for inclusion in topical skin care products and sunscreen as active ingredient  . Topical application of silymarin prior to UVB irradiation resulted in a substantial protection against photocarcinogenesis. This effect of silymarin is due to inhibition of several different events associated with UVB-induced tumor initiation and tumor promotion. In studies assessing the protection against UVB radiation -induced tumor initiation, silymarin showed considerable reduction in tumor incidence, tumor multiplicity and tumor volume  . Silymarin inhibits growth and causes regression of established skin tumours via modulation of mitogen-activated protein kinases and induction of apoptosis, making it a perfect candidate for the treatment in several types of epithelial cancer in humans , . Several studies with statistical relevant results were conducted on silymarin effects in reducing Rosacea   and Melasma , both skin conditions with facial manifestations. In Rosacea, silymarin action is multicentric and multiphase because of the direct modulating action on cytokines and angiokines normally involved and up-regulated in the case of such skin condition , while in melasma silymarin decreased the expression of tyrosinase protein inhibiting the melanin production . Silymarin effects in other skin conditions such as psoriasis, vitiligo  and acne  are currently investigated showing promising outcomes. Furthermore, the anti-inflammatory properties of silymarin proved to be efficient in wound management. Silymarin generated an increased fibroblast proliferation, collagen bundle synthesis and hair follicle population and consequently wound closure  and also modulated the inflammatory processes and total cellularity, improving the cellular and tissue maturity and increasing collagen and GAG production thus facilitating faster and better healing . Botanical source: Silybum marianum (L) Gaertn. Storage: Store in cool and dry place. Keep away from direct strong light and heat. "For long term storage, we suggest that silybin be stored as supplied at -20°C. It should be stable for at least two years. Silybin is supplied as a crystalline solid. A stock solution may be made by dissolving the silybin in an organic solvent purged with an inert gas. Silybin is soluble in organic solvents such as ethanol, DMSO, and dimethyl formamide. The solubility of silybin in these solvents is approximately 0.1, 10, and 20 mg/ml, respectively. Silybin is sparingly soluble in aqueous buffers. For maximum solubility in aqueous buffers, silybin should first be dissolved in DMF and then diluted with the aqueous buffer of choice. Silybin has a solubility of approximately 0.5 mg/ml in a 1:9 solution of DMF:PBS (pH 7.2) using this method. We do not recommend storing the aqueous solution for more than one day."